KiCad is a free software suite for electronic design automation (EDA). It facilitates the design of schematics for electronic circuits and their conversion to PCB designs. 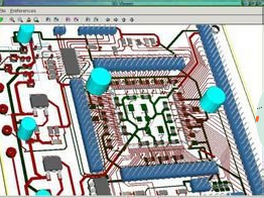 KiCad features an integrated environment for schematic capture and PCB layout design. Tools exist within the package to create a bill of materials, artwork, Gerber files, and 3D views of the PCB and its components. I'm making a PCB using a .bmp file as canvas for my design included in the eco1 user. There is no DRC used.The PCB type is using very large zones of copper and to avoid to place many tracks one after the other I would like to use filled zones but I don't know how to get copper for this areas ? If I understand what you mean is attaching in the little window, when you reply, there are buttons at the top of it. One is the upload button. For the net anything like a piece of track or a pin of a device works. The nets must be the same for the pour and the pin. You need a net that contacts the zone for the copper fill to work. Without a net, the copper pour won't pour.